Reduce the possibility of fire or electrical shock by keeping your workplace free from electrical hazards. Serious fire and shock hazards can result when electrical equipment is not maintained or used properly. Wall outlets are designed to provide electricity for only 2 appliances at the same time. Overloading them is a fire hazard. Use only 1 plug per outlet. Contact Facilities Management to discuss installation of more outlets if needed. Report broken or uncovered outlets. Replace cracked or damaged cords — do not tape over them. Stress where the cord attaches to the plug, or to equipment, causes cracks in the outer insulation. It's only a matter of time until the inner insulation cracks and problems occur. Do not use outlet adaptors — they can cause the circuit to become overloaded. Multi-plug adapters, such as cube adapters or unfused plug strips, are prohibited in UCSD facilities. 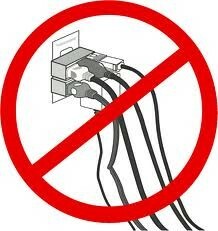 Extension cords are only allowed for temporary use — they may only serve one portable appliance, must be plugged directly into an outlet and must be able to carry enough amperage to run the appliance they are connected to. Improper use of extension cords and outlet adaptors can present a serious fire safety hazard in the workplace. Non-home electrical fires represented 13% of total 2007-2011 non-home structure fires, 5% of associated civilian deaths, 13% of associated civilian injuries, and 21% of associated direct property damage (National Fire Protection Association). The most common cause of fires from extension cords is improper use and/or overloading, especially when the cord has multiple outlets. Residential buildings, contact the Housing Maintenance Customer Service Center, (858) 534-2600. All other campus facilities, contact the Facilities Management Service Referral Desk, (858) 534-2930. A circuited multiple-outlet power tap may be used if you need to increase electrical supply in your area. These devices have an internal circuit-breaker switch that will stop electrical flow if overloading occurs. The cords are not intended to be routed through walls, windows, ceilings, floors or similar openings. Although relocatable power taps are allowed, use them safely and properly. Check to be certain the markings are readily visible on the back of the strip indicating the name of the manufacturer and testing laboratory used. Power strips are designed for use with small appliances and business machines, do not plug in heavy appliances with high-powered loads. Visually inspect all power strips regularly to ensure they are not pinched, crushed or damaged in any way. If a power strip becomes hot to the touch, unplug it and consult a licensed professional. Select the right extension cord. Is the cord for indoor or outdoor use? Cords rated for outdoor use can be used both indoors and out, but never use an indoor cord outside. How much electrical current (typically rated in amperes, or amps) does the tool or appliance require? The amperage requirement determines the wire size needed. Choose the right wire size for the intended use. Extension cords are rated by wire size, known as gauge. The thicker the wire, the more amps it will carry. Amperage requirements are usually given with the tool or appliance. A cord's wire thickness is identified by the letters AWG followed by numbers; typically 12, 14, or 16. On this extension cord, the AWG 12-3 means the wire gauge is 12 and there are 3 wires inside. In this case, less is more – the lower the number, the thicker the wire. Be sure the diameter of the extension cord is as large or larger than the cord being plugged into it. What is the maximum distance the cord will need to extend from the permanent electrical outlet? Select the right length of cord. The ability of a wire to carry a specific amperage will diminish as its length increases. If you need a lot of amps carried over a long distance, you'll need a heavier gauge wire. Use the chart below as a guide for selecting an extension cord of appropriate gauge and length for the amperage required. 25 ft. 16 ga. 16 ga. 16 ga. 16 ga. 14 ga. 14 ga.
50 ft. 16 ga. 16 ga. 16 ga. 14 ga. 14 ga. 12 ga.
100 ft. 16 ga. 16 ga. 14 ga. 12 ga. 12 ga. 10 ga. Inspect extension cords periodically for cracked or frayed insulation. Replace cords that show signs of wear. Do not tape over them. Do not link or "daisy chain" extension cords. Select a single extension cord long enough to do the job. Plug extension cords directly into the wall, not into a power strip or 3-prong adaptor. Never run an extension cord under carpeting or through walls. Never tack or staple an extension cord to the wall or woodwork — it could damage the cord and create a fire hazard. Maintain 30-inche clearance in front of all electrical panels. Label each circuit breaker, identifying the outlet it controls. Keep access to electrical panels free of obstructions. Electrical panels must have 36" of clear floor space in all directions. Electricity travels in closed circuits and wants to reach the ground any way it can. If you contact electricity, you become its conduit to the ground. Be aware of situations where you may act as a circuit ground when working near electricity. Never work on a "hot" (energized) circuit or electrical apparatus. If any of these warnings occurs, take it seriously. Disconnect power and have the equipment serviced.